Tucked away in Golden Hill State Park in upstate New York is a true treasure. I have to be honest you do have do some work to find this treasure. In the west coast of the United States I do believe we are spoiled with our big signs and directions to historical markers but in upstate New York its can be a bit more challenging. To make matters worse “Siri” on my iPhone was a horrible addition to this problem and more then a few times I was heard yelling at “her” to put the bottle down! Ole Siri’s directions were nothing short of talking to a local drunk about rocket science or how the world began. Thirty Mile Point Lighthouse is truly worth your time though. This beautiful piece of history sits on the southern shores of Lake Ontario. The Old Lighthouse was built in 1875 out of hand carved stone and is currently in a “restored” status. Lake Ontario and a stunning New York sunny day provided an amazing backdrop for this beautiful building. The very cool part of this little lighthouse is that for one dollar, per person, you can get access to the tower and roof. The bottom floor of the lighthouse is a museum, with each room representing a display of actual usage from patrons in the past. One very cool fact I learned was the second floor can be rented out “cabin” style through the park system. What a cool little get away that would be for a family! The tower was amazing, with solid steel grates, doors, and spiral stair case. Winding your way up top along the brick walls was just an amazing experience. For me old buildings like this are books, books with pages to so many stories. My mind can run wild with those who occupied and operated this facility to keep ships safe. The lighthouse actually works and operates. The currently restored tower runs on a modern day lighting system that does not require “manning” the lighthouse as past years required. Even though this is one of the smaller lighthouses I’ve seen it really is very well restored and getting to see things up and close can be quite amazing. When your on the roof the views are amazing. Lake Ontario was very crystalline blue, with overflowing waters that covered the old cement dock. The lookout over the park revealed an array of circular cabins (which you can rent), campers and a host of Amish using the camp ground. It can be quite nostalgic looking down from a building this old at little black buggies and pristine horses moving women and children around dressed much as they did long ago! Did I mention this lighthouse cost a dollar? I get so many people who complain that they can’t find adventure in their life because it is expensive…It is out there you just have to make your own adventure. You can make this little excursion better by not buying into the State Park employee’s grumpiness (or job boredom) by buttering them up with smiles and interest. Our state employee went from saltine cracker to a buttery cinnamon roll with a few compliments and interest into their day/knowledge. People have a lot to say if you take the time to listen. I’d like to think that the little extra we got from the employee was worth any expensive tour. Explore your world my friends! Listen to those old walls! They will talk, I promise! 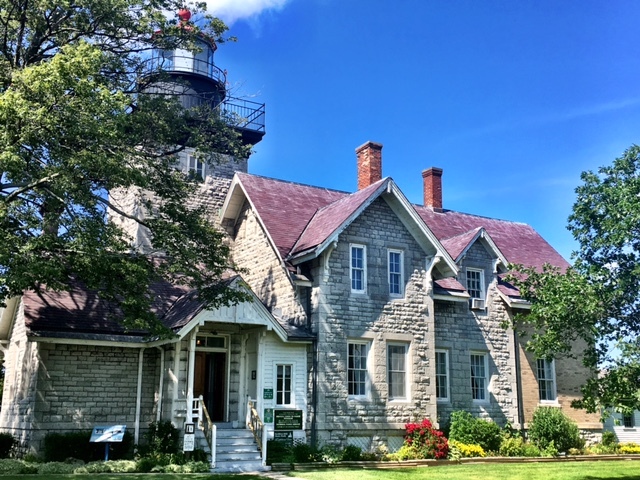 Fun Fact: Thirty Mile Point Lighthouse was one of five lighthouses chosen for postage stamps in the series “Lighthouses of the Great Lakes” that were available in 1995.